Lovely charming grapefruit, wild strawberry perfume with fluffy sweet floral bouquet of acacia. Mellow and intense exotic fruit flavor lingering on the smooth-textured finish. Great aging potential. 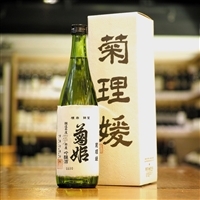 Junmaiginjou Nama Genshu is freshly brewed seasonal release from Abekan. Hiyori rice polishing ratio is 55%, unpasteulized and undiluted. Among series of Abekan, this bottle is most intense and tasty, yet smooth texture and crystal-like transparency - a signature of Abekan. Very good for winter - spring seafoods. The Terroir Saké. This project is focucing on 100% Junseki plateau where the brewery is situated. Nakate-Shinsenbon Rice from local farmers, water from Jinseki, brewed by artisans in Jinseki. 30BY was made by Kimoto and first lot has been released as 3U version. 神石高原１００％で造られた酒。地元の農家：古里公助氏と宮崎範之氏が栽培した中生新千本（なかてしんせんぼん）、神石高原の仕込み水、神石高原の蔵人たちが醸した土地の酒。きめの細かい落ち着いた旨味、艶があって滑らか。静かで上品な切れ味。神雷シリーズに較べてやや優しいふくらみに和みます。 Freshly brewed in this winter, Unfiltered, Unpasteurized, Undiluted. Local Senbon-Nishiki 100%, rice polishing ratio 60%. New star from Hiroshima. Fruity aroma, full of Umami, lovely sweetness of rice, middle weight, everything is in perfecy balance. 100% Yamadanishiki, 40% Polish.